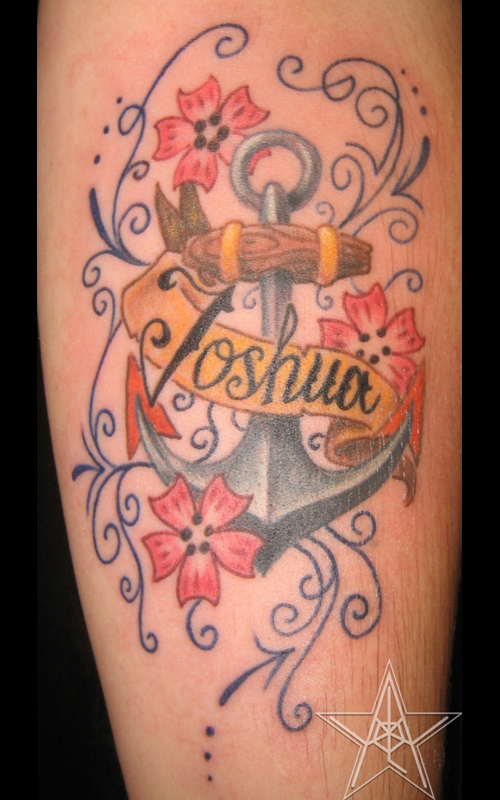 The Graduate Color custom flowers with anchor and filigree tattoo. 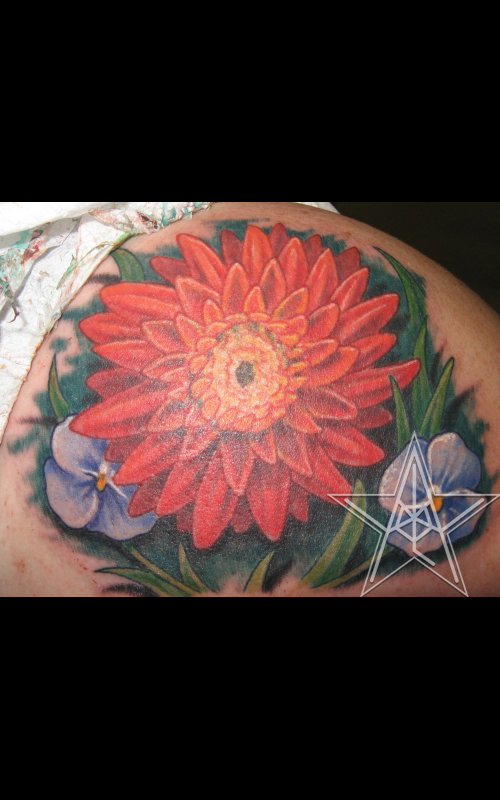 Becky's Brenna II Color custom flowers with carved stone tattoo. 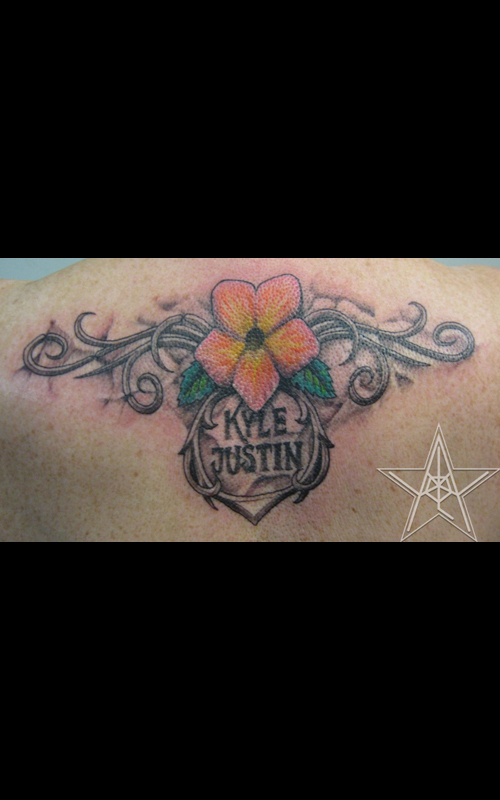 Kanji with Blossoms Color custom flowers with filigree freehand tattoo. 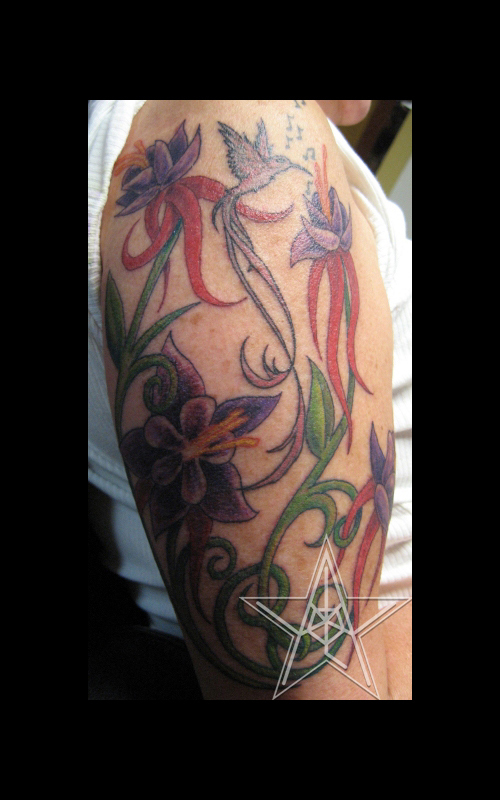 A Gift Color custom flower boquet freehand tattoo. 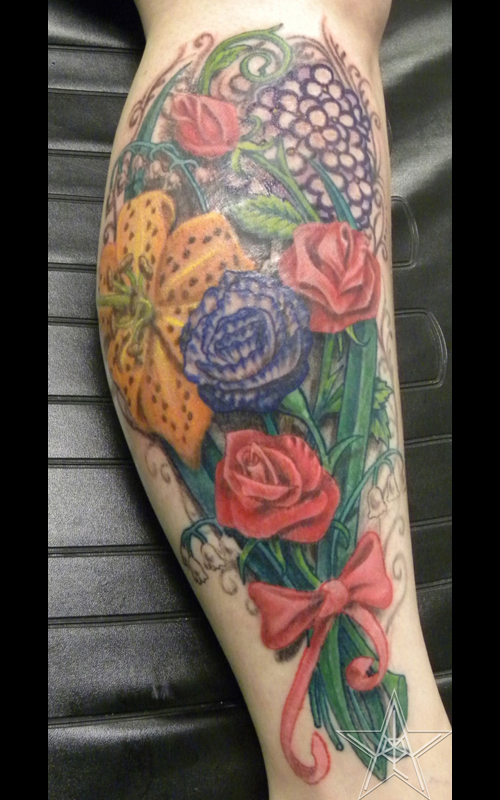 For the Kids Color custom flowers freehand tattoo of birth flowers. 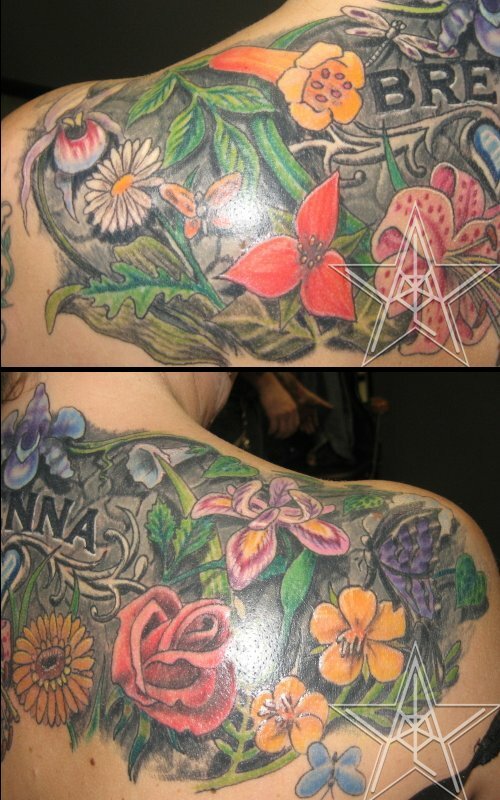 Beauty through Stone Color custom flowers with stone tribal tattoo. 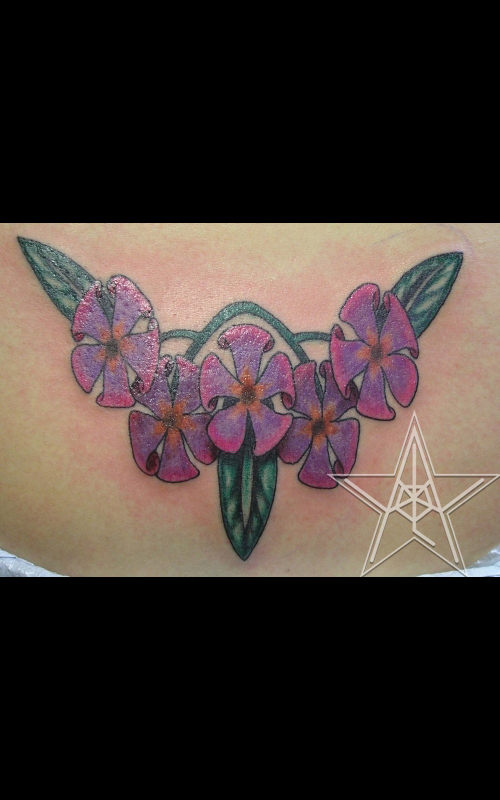 Formation Color custom flowers tattoo. Foot Swirl Color custom flowers foot tattoo. 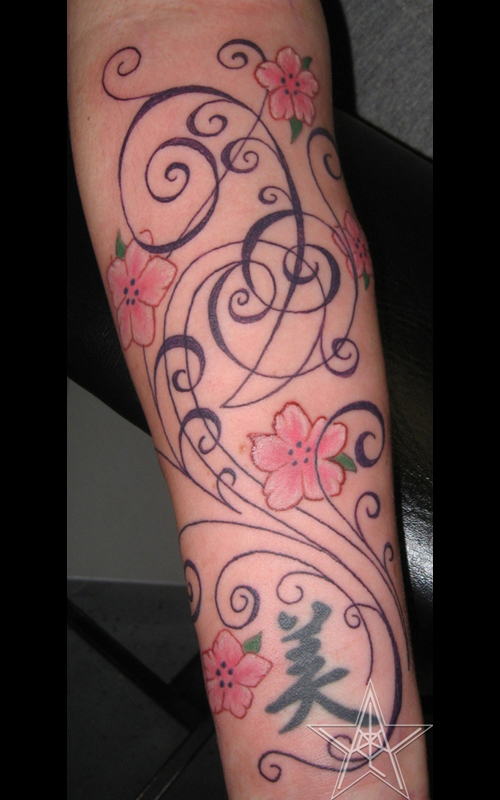 Singing in the Flowers Color custom flowers with hummingbird tattoo. Kicker Footprint with filigree tattoo. 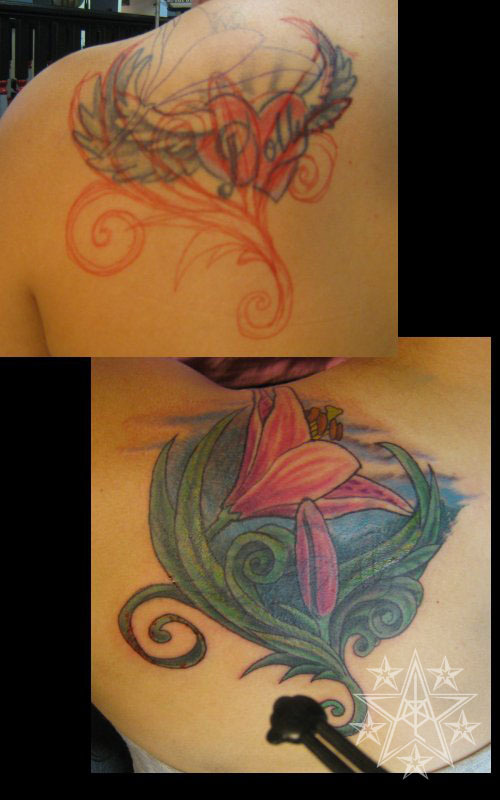 Chasing the Lily Color custom flower and butterflies tattoo. 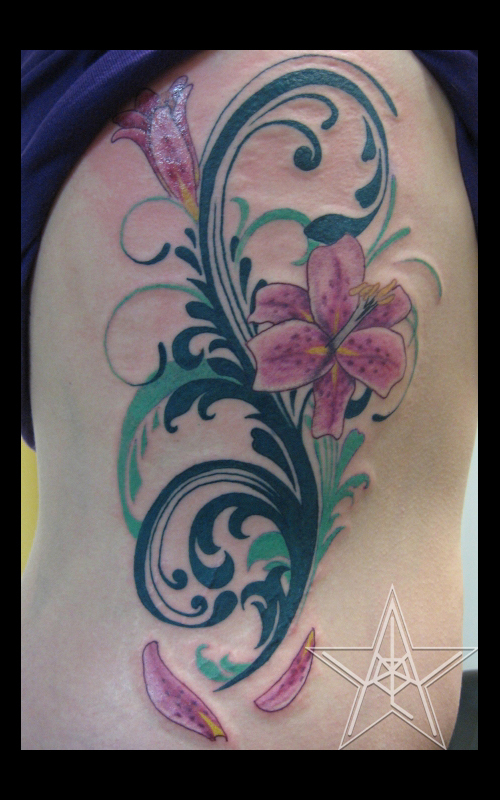 Lillies and Scrollwork Lillies with filigree from reference color tattoo. 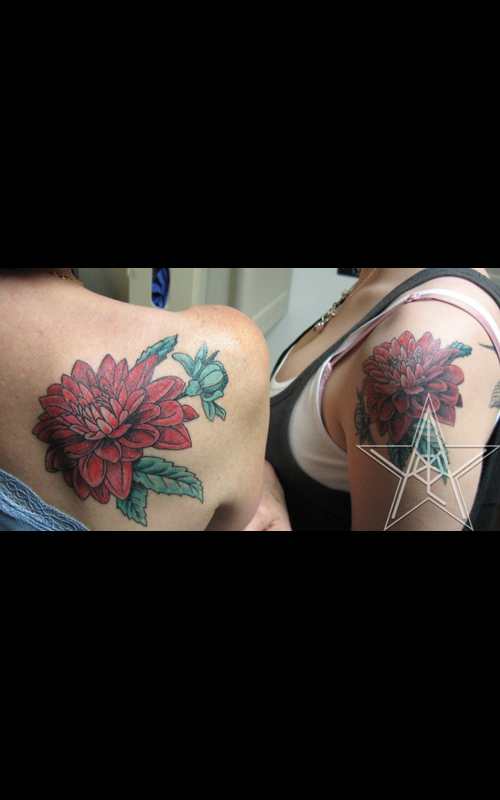 Matching Set Color custom matching flowers tattoo. 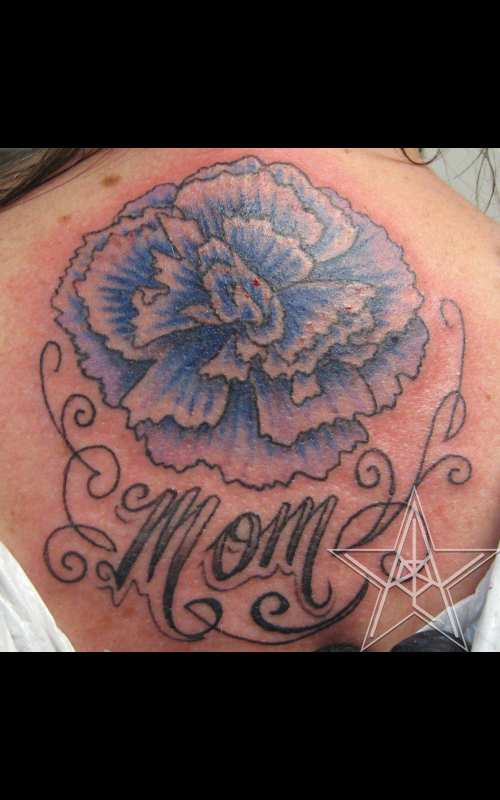 Mom Color custom flower with filigree and lettering tattoo. 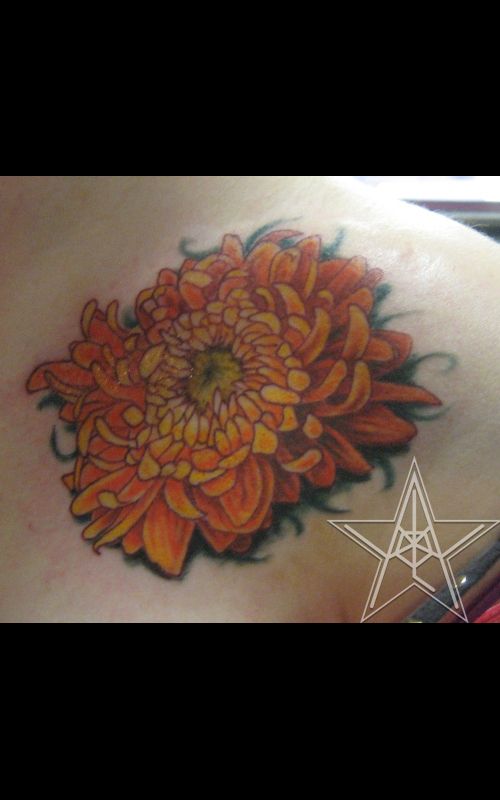 Mum Color custom chrysanthemum flower tattoo. 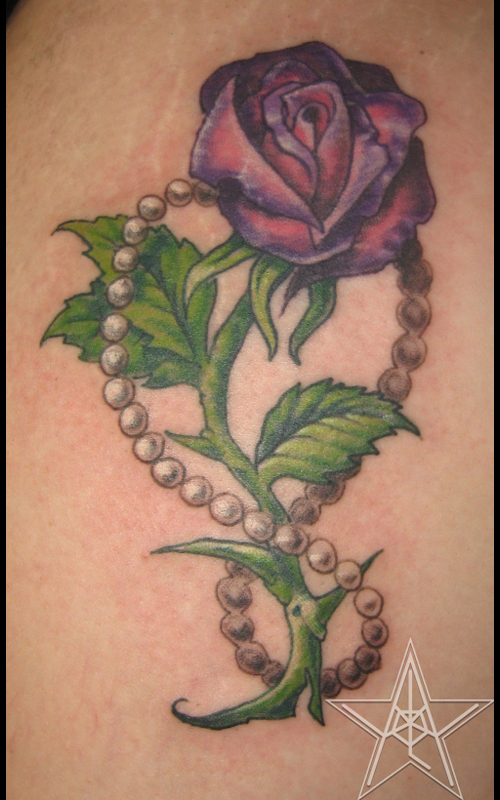 Rosenpearls Color custom rose with pearl necklace tattoo. 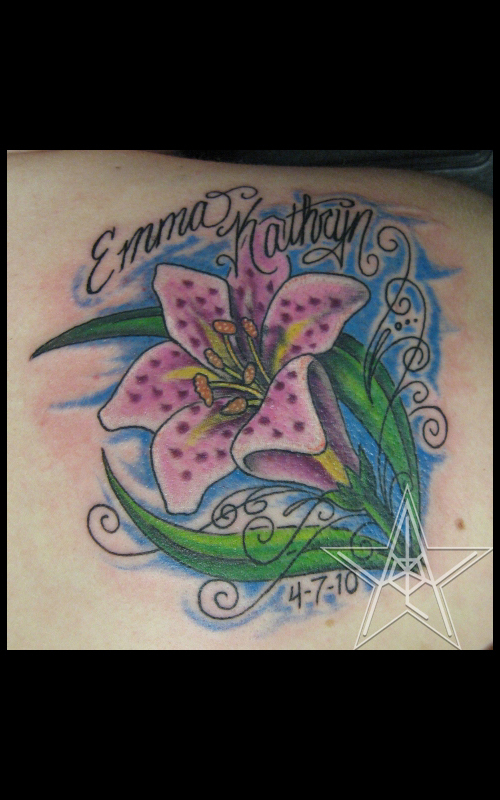 Lily Names Color custom flower with names tattoo. 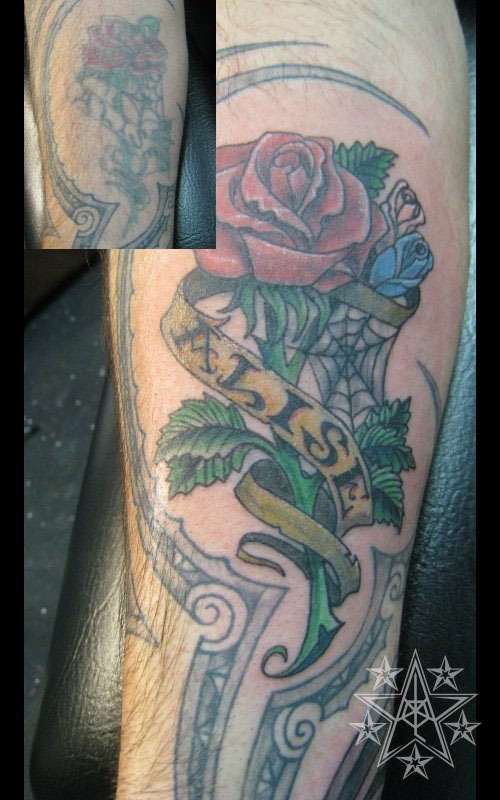 Ivy Shoulder Color custom flowers freehand ivy tattoo. 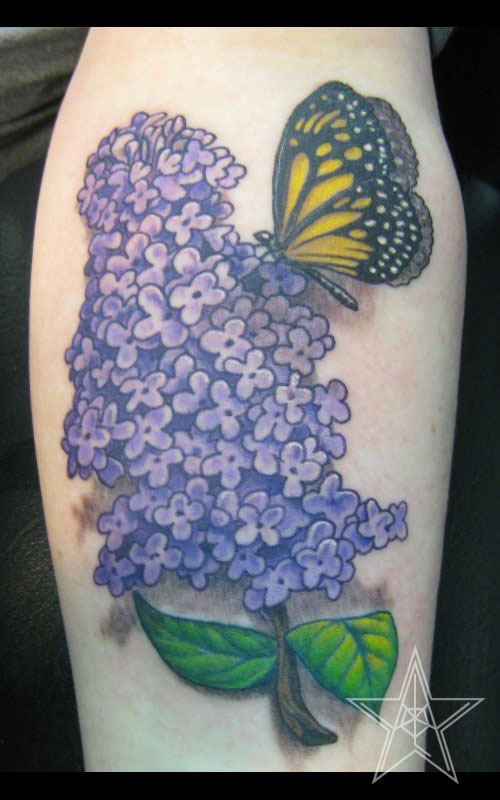 Lilac and Monarch Custom color flower tattoo. 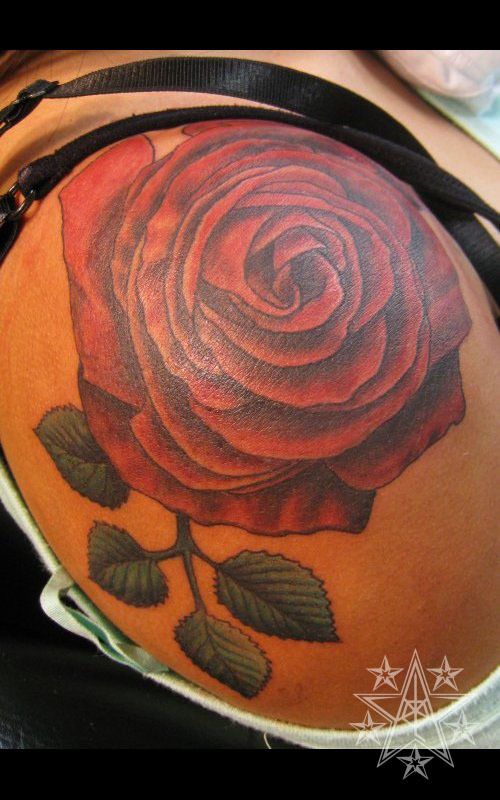 Big Bloomer Realistic rose tattoo. 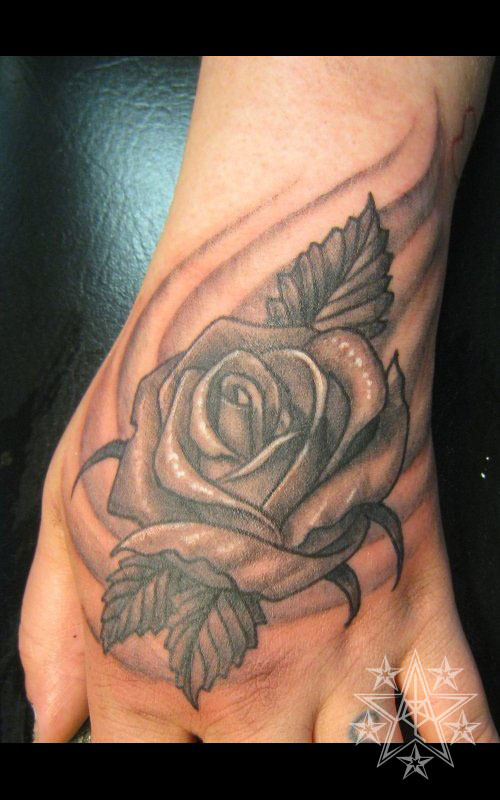 Rosenhand Rose with smoke tattoo. 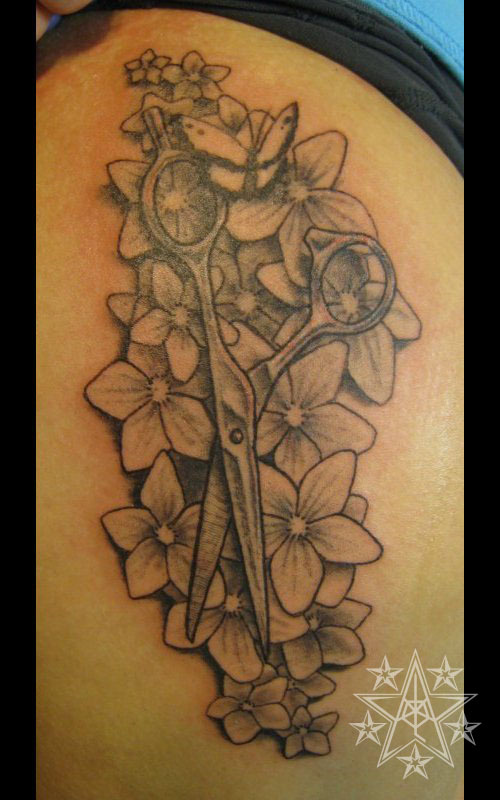 Sleeping Scissors Scissors on a bed of flowers tattoo. 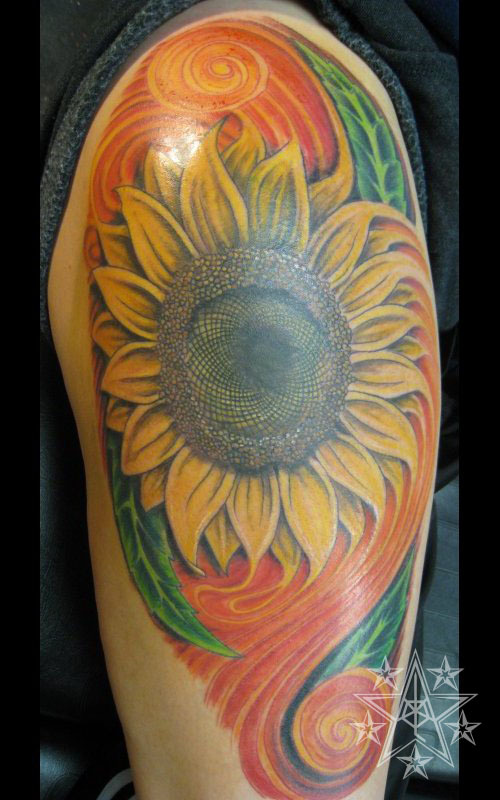 Sunflower Thigh Sunflower cover up tattoo. 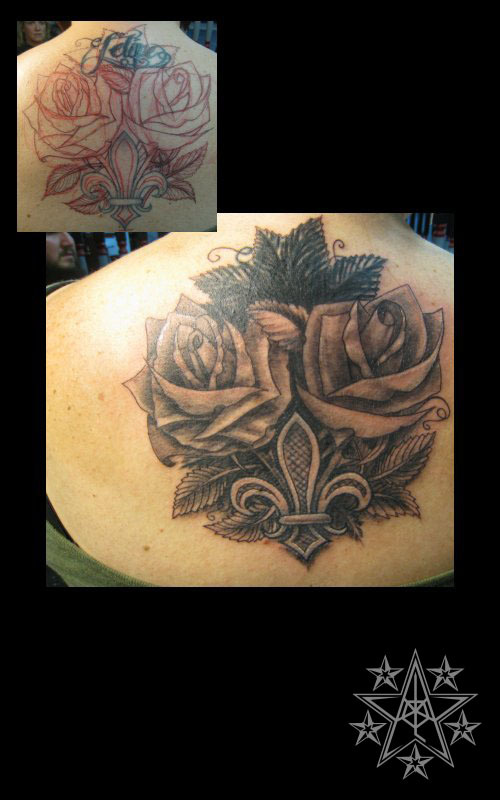 French Roses Fleur de Lis tattoo. 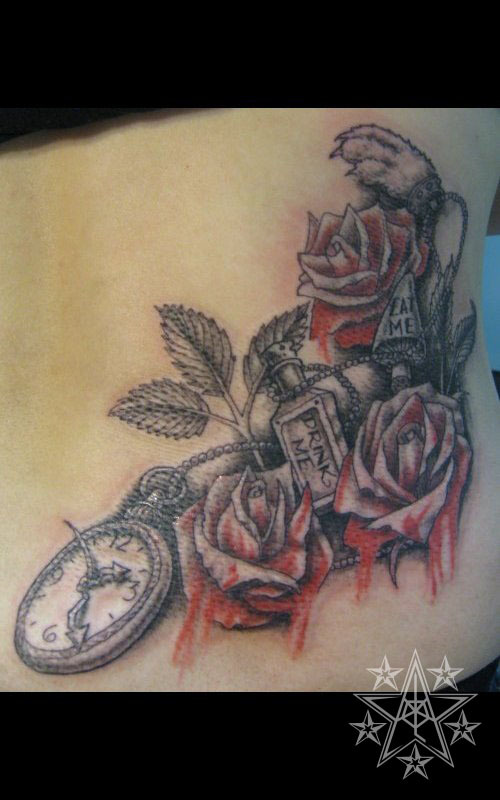 A touch of Alice Alice in Wonderland tattoo. 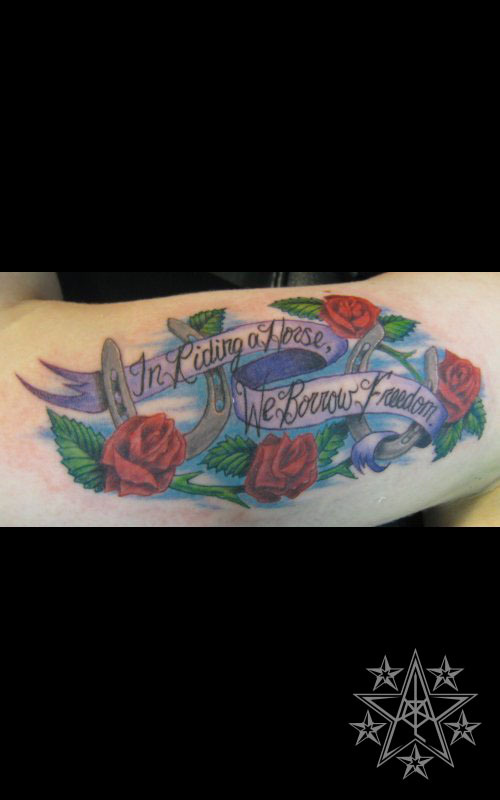 Rosenshoe Horseshoe with roses tattoo. 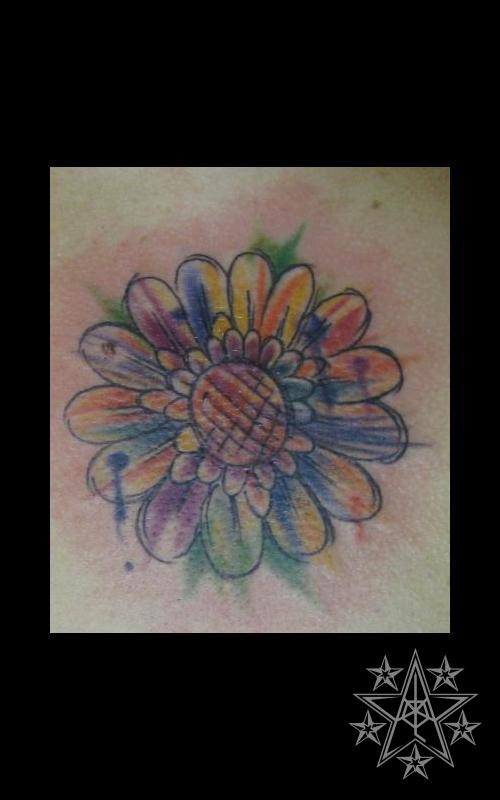 Watercolor Daisy Watercolor Gerbera Daisy tattoo. 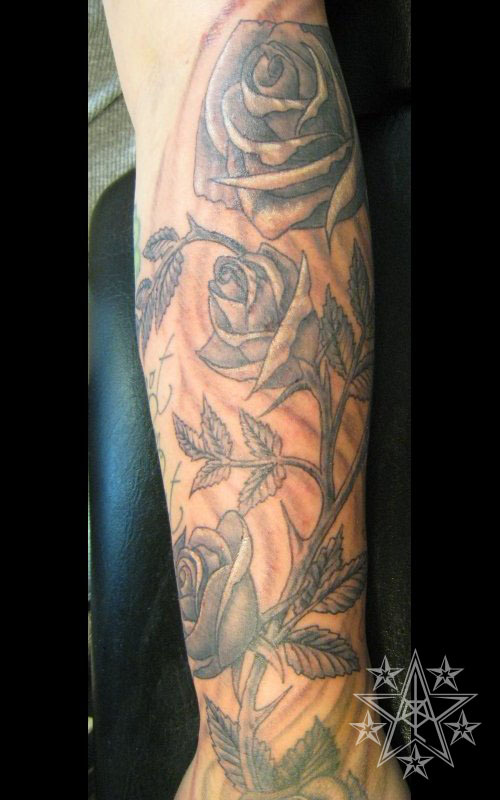 Rosensmoke Roses with smoke tattoo. 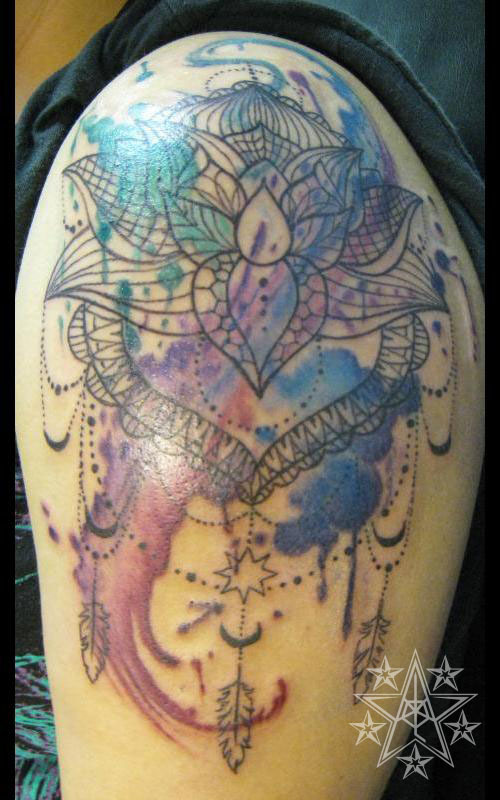 The Pretty Things Watercolor lotus tattoo with beads and feathers. 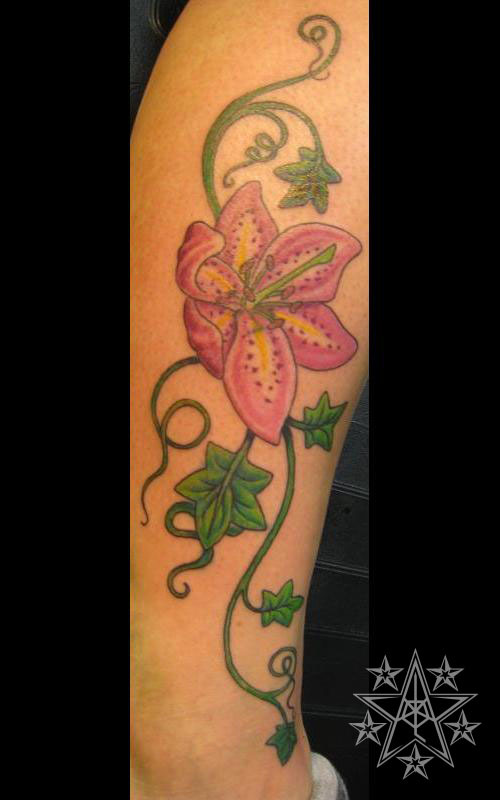 Vine and Lily Stargazer lily with a vine calf tattoo. 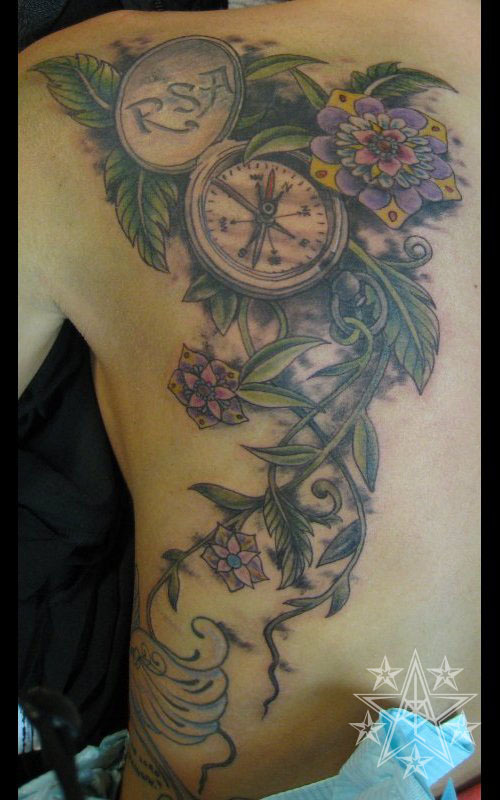 Directional Growth Compass surrounded by flowers tattoo. 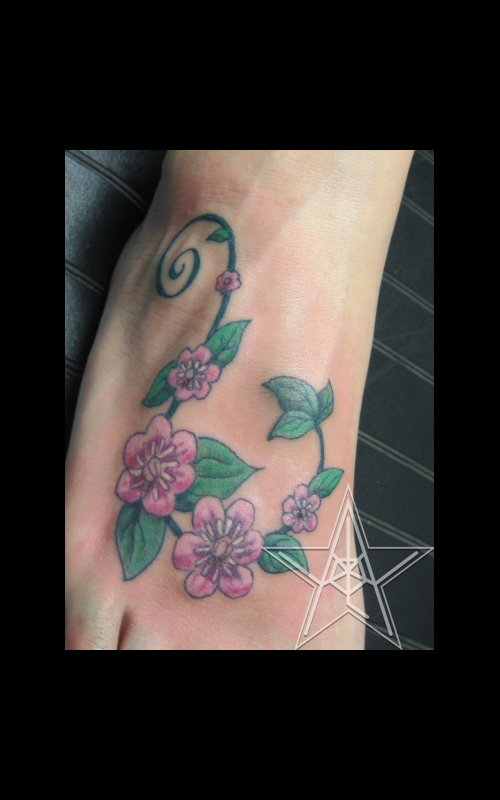 Foliage tattoos by Ray Reasoner Jr.
Daisy: This flower is associated with wanting love. "He loves me, He loves me not." Hibiscus: A beautiful tropical plant. Iris: The three upright petals symbolize faith, valor, and wisdom. The fleur de lis is a stylized form of the iris. Lilies: These are beautiful flowers that come in many color variations. There are also water lilies, which are more similar to the lotus in shape and the environment where they grow. Lotus: These are flowers that grow from the mud and the muck to bring beauty to the swamp. In Hinduism it represents purity. To me it represents rising above your situations and surroundings to bring beauty into the world. Plumeria: In Hawaii the plumeria symbolizes spring, rebirth, and life. Roses: Roses have quite a bit of symbolism associated with them, depending on their color. White: Humility, Reverence, Purity, Innocence.